How to Use Neem Oil Effectively to Treat Common Skin Problems! The parts of neem tree have been used since ages past as a therapeutic cure in the Indian systems of Ayurveda, Siddha and Unani medicines. Besides this, Neem has been one of the prime ingredients in many natural beauty products, considering their effectiveness in nurturing the skin and hair. Therefore, in this article, let us peek into some of the attributes of Neem oil for skin problems. The pulpy fruits of the Neem resembling an olive contain a few brown-coated kernels within them. These parts (fruits and seeds) have been one of the prime sources for the extraction of oil. The most common method of oil extraction is by way of cold pressing the seed kernels in order to separate the oil from the husk. Another method of extraction is to immerse the crushed seed kernels in hexane, an organic solvent. This type of extraction process produces inferior oil, which is widely used in personal care products, unsuitable for direct application on the skin. The key chemical constituents of Neem oil are triterpenoid substances such as Azadirachtin and Nimbin besides triglycerides, sterols that include stigmasterol, beta-sitosterol, and campesterol. The oil also holds fatty acids like Omega-6, Omega-9, stearic and palmitic acid. These compounds of the neem oil bestow antiviral, antimicrobial, antifungal, antiseptic, antihistamine, antioxidant, anti-inflammatory, cicatrisan, immune stimulant, circulatory and astringent properties for treating most skin-related problems. Since ancient times, Neem oil has been widely used as an effective remedy for treating most conditions ranging from acne to psoriasis. Here is a list of how to use neem oil for eczema and a wide variety of other skin problems. 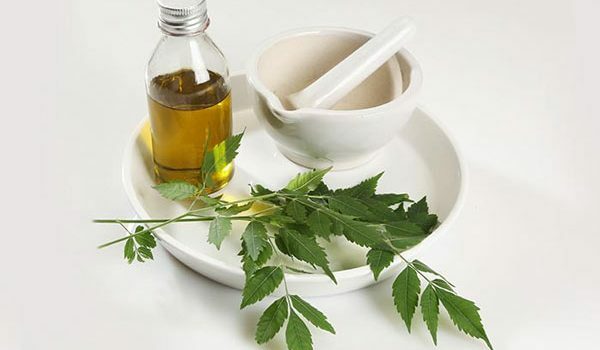 Neem oil has been widely used as an alternative remedy for treating the symptoms of scabies. This occurs due to infestation of a mite, Sarcoptes scabiei, that penetrates into the skin to feed on blood and cause symptoms of itching. Neem oil, however, helps eliminate them and aids in getting rid of painful symptoms like inflammation and itching, decreasing skin redness and keeping the skin smooth. One of the best remedies for scabies is to soak for fifteen or twenty minutes in a bath mixed several spoons of Neem oil combined with liquid soap to dissolve the oil. After the bath applying a Neem based lotion/cream on the infection, helps soothe the symptoms. The list of ways to use neem oil for skin problems is off to a great start! Herpes, an oral or genital condition caused by herpes simplex virus known as HSV-1 or HSV-2 produces symptoms of itchy painful sores and blisters. This condition, like many skin conditions, does not have a fix-it-all cure and instead requires constant treatment to mask the symptoms. Nevertheless, the antiviral and antihistamine properties that exist in Neem oil help relieve the lesions and ease symptoms. Applying Neem oil using a cotton swab on the blisters, helps accelerate healing by reducing burning and pain associated with this condition. Eczema, or dermatitis, is a very common inflammatory skin disorder producing symptoms of excessive itching, redness, skin cracking, weeping and dryness, often leading to secondary infections. The solution most people tend to take when dealing with eczema is to scratch the affected area. Believe it or not, this only makes the condition worse, causing it to ooze and potentially spread to other places. Since this condition is hereditary, there is no cure for eczema except to manage the symptoms. Some of the ways to avoid a flare-up of eczema is to steer clear of things that might trigger an allergic reaction in the skin such as animals, dust, pollen, soaps and perfumes, mold, certain medications, wool, or smog. However, because some of these are practically unavoidable, you need to turn to a consistent and natural way to keep the symptoms under control in a way that won’t do more harm than good to your skin. Fortunately, Neem oil contains anti-inflammatory substances like nimbidin and nimbin helps ease symptoms of redness and swelling, replacing the irritated, cracked skin with a soothing sensation. If you suffer from eczema, this sounds like a dream come true. Quercetin present in Neem oil promotes the body’s response to inflammation by restricting the production and release of irritants in the body. Besides Neem oil, loads of essential fatty acids and vitamin E content restore the protective barriers of the skin, protect loss of moisture, and heal cracked and dry skin. Above all, the skin antiseptic properties. Besides Neem oil, with loads of essential fatty acids and vitamin E content restores the protective barriers of the skin, protects loss of moisture and heals cracked dry skin. Above all, the skin antiseptic properties protects from bacterial and secondary skin infections. Therefore, for best results and for skin hydration add a few spoons of Neem oil to bath water and follow it up with a Neem-based lotion on moist skin. Using Neem oil for eczema is a great way to combat the irritating symptoms without damaging your skin or creating nasty side effects. Psoriasis is a chronic inflammatory skin condition triggered by environmental factors. The symptoms manifest as dry scaly reddened skin patches with severe itching. An autoimmune disorder, psoriasis produces rapid growth and renewal of skin cells within days while the normal process takes months. This condition leads to accumulation of dead skin cells on the surface of the skin. The dead cells grow from the innermost layers of the skin and appear in silvery patches on the surface. Neem oil possessing antimicrobial, antihistamine and anti-inflammatory substances help dispel pain, itching, redness and skin inflammation. Further, the oil combats the bacteria that settle in the cracked, broken skin and owing to the antiseptic substances provides healing. Neem oil makes an excellent remedy for common fungal infections like ringworm, athlete’s foot, and nail fungus. This is because the active antifungal properties in the neem oil destroy the fungi responsible for instances of fungal infections. To get rid of such conditions, place a couple of drops of Neem oil on the affected area twice or thrice a day. For excellent results, repeat this process until it heals completely. Skin pigmentation occurs due to excessive production of melanin. However, Neem oil helps regulate the production of melanin and helps clear the skin, giving you a smooth, consistent color for your skin. Apply a few drops of Neem oil on the pigmented regions and massage gently in circular movements. Leave it overnight and cleanse the following morning. Acne is caused when the pores on your skin become blocked, keeping the sebum (oil that your body produces naturally) fro escaping and allowing it to build up behind your pore. This buildup is the pimple. The pain that you may experience is due to an infection of bacteria that feed off of the sebum. As gross as it sounds, acne is among the most common skin conditions plaguing us today. The antibacterial and antifungal properties present in Neem oil helps combat acne. Neem oil contains a substance similar to aspirin that helps destroy the acne causing bacteria. Further, since Neem oil possesses high fatty acids, applying a few drops of Neem oil on acne and leaving it overnight helps get rid of acne and protects the skin from further breakouts. Neem oil with skin friendly properties is an amazing solution for treating scars and marks. Dab Neem oil on the skin marks using a soft cotton ball and leave it overnight. Wash it with cold water in the morning. Regular application of Neem oil will gradually help the scars to fade. With excellent skin conditioning properties, Neem oil is one of the best-recommended remedies for alleviating dry skin, especially on the face, legs and hands. Neem oil helps retain moisture when applied on the skin, due to the oils natural hydrophobic tendencies. Besides, the oil locks to the skin without being washed off while washing the hands and face to get rid of dirt and grime. Neem oil counteracts the harmful effects of the harsh ultraviolet rays of the sun. With exposure to the sun’s rays, the skin’s collagen becomes damaged resulting in fine lines and wrinkles. This process is known as the photo aging wherein the skin has a tendency to age as in the normal process. Moreover, the harsh UV rays of the sun producing free radicals in many instances lead to skin cancer. Nevertheless, the skincare properties existing in Neem oil works as an amazing post exposure remedy for your skin. The antioxidant substances in Neem oil help counter the free radical damage, while the anti-inflammatory substances help assuage skin discoloration and pain. Further, the huge amounts of fatty acids in the oil help restore collagen and rejuvenate skin. Neem oil is an excellent antidote for wounds, cuts, and bruises. The antiseptic, anti-inflammatory properties in the oil accelerate healing and clear bruises. Neem oil is an effectual treatment option for eliminating unsightly moles and warts. The chemical components in the oil eliminate the virus by absorbing the virus and protecting from further occurrences. Topical application of Neem oil using a soft cotton ball and cover with gauze helps warts fall off gradually. However, it is imperative to repeat the process until the warts come out completely. Undiluted Neem oil when applied topically poses a possible risk of developing allergic reactions in people with sensitive skin. This can cause symptoms of skin irritation, redness and skin rash. Therefore, to avoid unpleasant side effects, it is advisable to mix it with coconut or almond oil. You should also consult a doctor before use. In addition, the oil is unsuitable for use on children or ingested, as it can cause adverse reactions. We hope that you learned a lot about the practical uses of neem oil for eczema as well as other skin problems. If you liked what you read, be sure to share this with anyone who could benefit from the information!